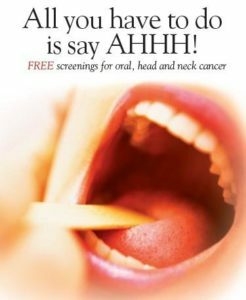 Oral cancer screening. On line education and awareness. Orange Regional Medical Center, 707 E. Main St.
A free screening for Oral, and Head and Neck Cancers; call for appointment only: 888-321-6762. We will organize a week of prevention for the patients of the Oncology service of Santa Casa de Araraquara. The possibility of screening for head and neck cancer through clinical examination and informative lectures will be open to all cancer patients, family members and the general population. Three days of screening will be organized during. HCG - The Specialist in Cancer Care has been at the forefront in fighting cancer. With 24 centers, it enjoys the reputation of being India's largest cancer care provider. HCG is turning hope into reality for more than decades now & with an experienced team, top national rankings and leadership in cancer prevention, we rule. Fox Chase Cancer Center and the Temple Head & Neck Institute are proud to offer multiple H&N Cancer screenings throughout Philadelphia during Oral, Head and Neck Cancer Awareness Week 2018. To attend - you can simply show up! Walk-ins are encouraged! Or call 215-728-0574 to confirm a time and location We will be offering the. The entire staff of ENT Dept of the University of Abuja teaching hospital gwagwalada shall carry out teaching and awareness program on prevention and early identification of oral, head and neck cancers. This programme shall be conducted among the staff and inhabitants of the University of Abuja teaching hospital and Gwagwalada community between April 8-15,. 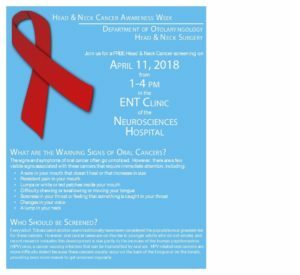 The Department of Otolaryngology-Head and Neck Surgery at UIC in conjunction wtih UI health will be hosting a free Head and Neck Cancer Screening Day on Wednesday April 11, 2018. The event is open to the public and participation is encouraged. The purpose of the screening day is to assess patients for pre-cancerous or cancerous. Annual Oral Head and Neck Cancer Awareness for Veterans, veteran/employees and employees @ Edward Hines V.A. Hospital Building 228 Room 1061 from 1p-3p. Free Head and Neck Cancer screening by UNC Head and Neck Surgeons. Education will be provided on speech pathology, dental care, nutrition, HPV, smoking. and Head/Neck Cancer. The event is open to the public and participation is encouraged. 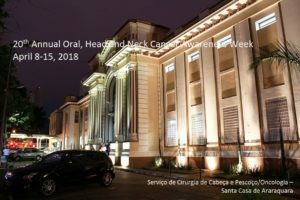 Head and Neck Cancer Awareness Week Department of Otolaryngology Head & Neck Surgery April 11, 2018 from. Screening for oral cancer will be done by a group of oral and maxillofacial surgeons lead by Associate Professor Dr. Nasir Uddin, who is doing surgery and research on oral cancer in Bangladesh successfully. After proper diagnosis and evaluation, patients for curative surgery will be selected. They will be operated with minimum operation charge or. Location: The Center for Cancer Care at Griffin Hospital, 350 Seymour Avenue, Derby, CT. Description: A 2 hour FREE clinic staffed by physicians and dentists who will complete a physical examination of your mouth, head and neck area to evaluate for signs and symptoms associated with cancer. The examination takes approximately 10 minutes. Oral and Maxillofacial surgeons, medical oncologists, and radiation oncologists discussing treatments, screenings, surveillance, and the newest medicine for oral cancer. Survivors and family will be speaking regarding their experience with the disease. Screening for oral cancer will be done by a group of oral and maxillofacial surgeons leaded by Associate Professor Dr. Nasir Uddin, who is doing surgery and research on oral cancer in Bangladesh successfully. After proper diagnosis and evaluation, patients for curative surgery will be selected. They will be operated with minimum operation charge or.